Rev. J. Gary and Lori Ellison joined the JBI faculty in August 2007. They have taught in Bible schools in Ghana, Ivory Coast, Togo, Belgium and French Polynesia. Gary was appointed to serve as principal of JBI the beginning of 2011. He teaches Bible and Theology. He has a B.A., M.A., M.Div, and has done doctoral studies. Lori Ellison grew up in Vanuatu. She has A.A., B.A., and M.A. degrees. They have two children. Rev. Philip Naias has been on staff at JBI since 2006. Philip graduated from JBI in 2001 and earned a B.A. from South Pacific Bible College, Fiji, in 2004. Rev. Naias serves as Director of Grounds and teaches various subjects. He is currently working on an M.A. in Biblical Studies at the West Africa Advanced School of Theology in Lomé, Togo. Philip and his wife Serah have a little boy and another child on the way. Rev. Kiel Maimai has been on staff since 2010. He graduated with a B.A. in Bible from the South Pacific Bible College and serves as the Dean of Students. He and his wife Faith also have a little boy with another child on the way! Rev. Maurice Nicholson has ministered for many years in various countries of the South Pacific. 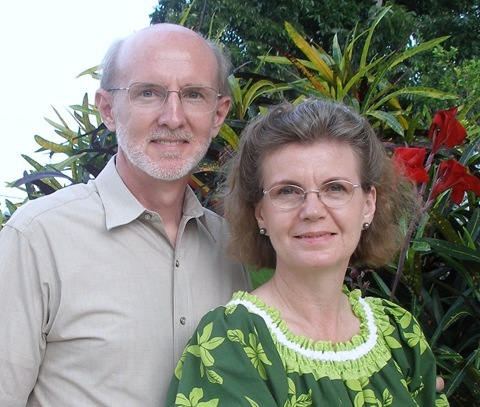 Longtime Bible teacher at the South Pacific Bible College in Fiji, Maurice and his wife Margaret have greatly served JBI. Maurice teaches courses on Early Biblical History (Genesis 1-11), Daniel and Revelation, Romans and Galatians, and wherever needed. He also gives Bible conferences on various issues facing the church. He was featured in the Creation Ministries International article “Creation among the coconut palms.” Rev. Nicholson has the following degrees in science and theology: B.Agr.Sc., Grad.Dip.T., M.Bibl.Th. Rev. and Mrs. Russell Harbour are longtime friends of JBI as well. Russell teaches courses on Bible Doctrines. Robyn teaches courses on English and Education. Together they team teach on Marriage and Family. They also conduct seminars on sexual purity and have worked with the young men’s Royal Rangers program locally and internationally.